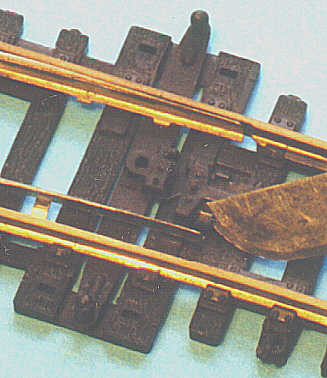 The over centre action is accomplished using a 'V' shaped spring with a prong at each of the tips. When viewed in profile this has an 'L' shape. 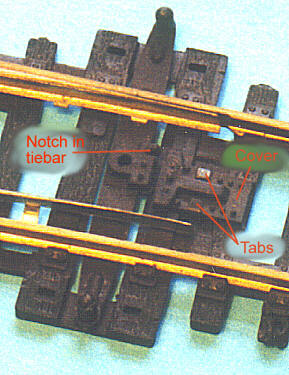 One prong is located in a notch in the tiebar, the other is secured under the cover held down on the sleeper base by two tabs. 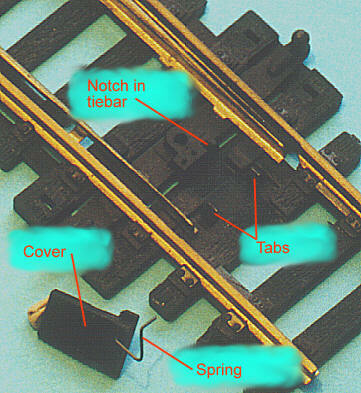 As the tiebar is moved from side to side the spring is compressed. 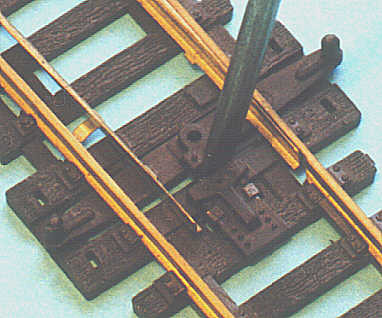 The spring is at maximum compression in the middle of this travel and most relaxed at either extreme thus pushing the switch rails against the stock rails. If the action is too stiff the spring tension can be eased by increasing the separation between the tiebar and the spring cover. This can usually be achieved by carefully inserting the blade of a small flat blade screwdriver and using this to lever the cover backwards. When using this technique ensure the screwdriver is not pressed down too far as it could damage the 'V' spring. If the cover is reluctant to move it's securing tabs can be eased up using a knife blade, jeweller's screwdriver or similar. Be careful once the tabs are loosened that the spring's tension doesn't cause it, and the cover, to disappear into the distance! With the tabs fully loosened it is possible to completely remove the cover. There's normally no reason to do this. The only two I can think of are to replace a broken spring or removal of the spring when operating the the turnout with a slow motion actuator of some sort (e.g. a Tortoise switch machine).